You also have the option of placing all of your DNS records into a single DNS record group. Click DNS Checks in the top navigation bar. Click the Add DNS record group button. Give the new DNS record group a name, and optionally a description, and nameserver to query. 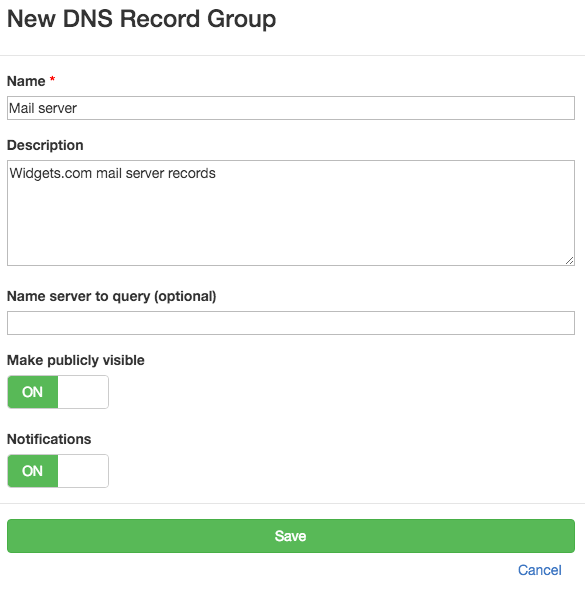 A more detailed tutorial on creating DNS Records Groups, and importing DNS records into them is on the Share DNS Records page. DNS record groups which have this option turned off can only be viewed when logged into your account. More details are in the Share DNS Records page. Each zone file represents a subset of the DNS hierarchy. For example, if you registered example.com and example.net, then you would typically have two zone files - one for each domain. Each domain's zone file would typically contain all DNS records for that domain. DNS record groups and zone files can have a one-to-one relationship if you'd like, but they don't have to. You can group DNS records in the manner that makes the most sense for you. For example, if you have a web server which hosts multiple websites, then you may wish to create a DNS record group for all DNS records which point to that web server.